I've decided to re-vamp the layout of the hounds and see how I like it (your comments are appreciated). 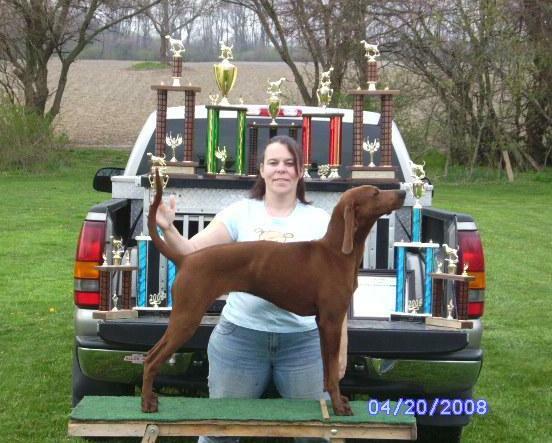 On this page, I will give links to the dogs who are primarily bred for show. 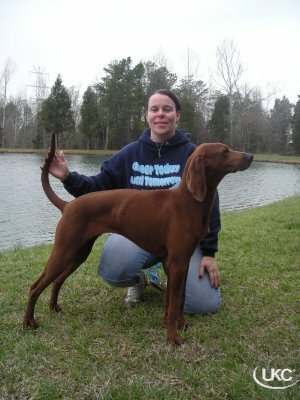 See the HUNTING DOGS page for the dogs primarily bred to HUNT. Things change as the tide turns. 2008 has found Kat & Sydney knee deep in the Purina Race. Syd went 8 shows for 8 wins & 45 dogs defeated from registered to GRCH in less than 2 mths!! Our intentions are to keep Sydney at the top of the breed Purina Race and in the top 5 overall (she is currently #2) and hit some shows with Crown who is also a nice asset to our program! We will be breeding 'PR' Tree Rizin' Quadruple Crown (who is out of WSHOWCH Dutch X GRCH Trippy. We intend to line-breed Crown to capitalize on her winning line. We will be breeding UKC GRCH AKC CH NKC CH 'PR' Tree Rizin' Triple Crown (Trippy) to WSHOWCH GRWCH GRFCH GRCH 'PR' Only In America (Dutch) when she comes into heat (due in around June of 2008). 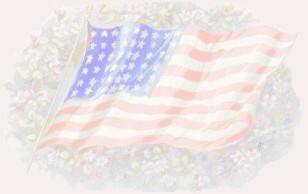 ** We've had several folks interested in purchasing Sydney- again, we appreciate the interest, but she is NOT for sale. We've also had some inquiries about pups off of Sydney. We do not expect to breed Syd until at LEAST 2010 and currently have NO PARTICULAR stud in mind for Sydney. Watch our website & we'll update as decisions are made.